Boost Confidence. Increase Scores. Get Ahead. 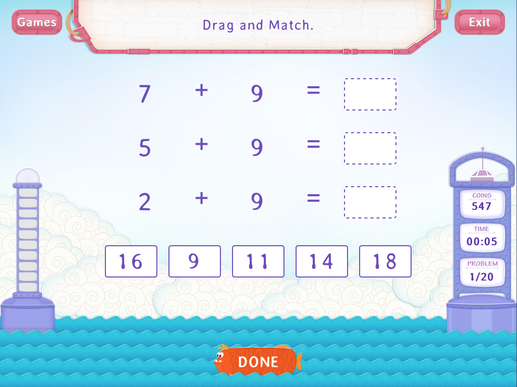 Why parents choose Splash Math for their first graders? First grades requires students to internalize addition facts involving 1 digit numbers. These facts are building blocks for addition of greater numbers using the standard algorithm. Add 9 to a Number Worksheet focuses on practicing adding 9 (plus 9) to numbers within 20. 1.OA.6Add and subtract within 20, demonstrating fluency for addition and subtraction within 10. Use strategies such as counting on; making ten (e.g., 8 + 6 = 8 + 2 + 4 = 10 + 4 = 14); decomposing a number leading to a ten (e.g., 13 — 4 = 13 — 3 — 1 = 10 — 1 = 9); using the relationship between addition and subtraction (e.g., knowing that 8 + 4 = 12, one knows 12 — 8 = 4); and creating equivalent but easier or known sums (e.g., adding 6 + 7 by creating the known equivalent 6 + 6 + 1 = 12 + 1 = 13).